Sociologists, historians, and other social observers have long considered the secularization of American public life over the past hundred and thirty years to be an inevitable and natural outcome of modernization. This groundbreaking work rejects this view and fundamentally rethinks the historical and theoretical causes of the secularization of American public life between 1870 and 1930. 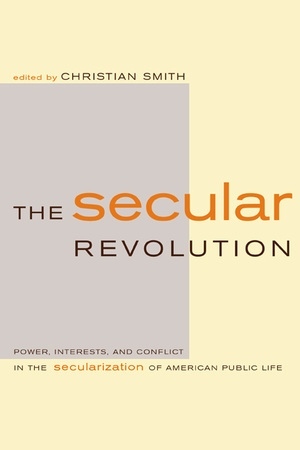 Christian Smith and his team of contributors boldly argue that the declining authority of religion was not the by-product of modernization, but rather the intentional achievement of cultural and intellectual elites, including scientists, academics, and literary intellectuals, seeking to gain control of social institutions and increase their own cultural authority. Writing with vigor and a broad intellectual grasp, the contributors examine power struggles and ideological shifts in various social sectors where the public authority of religion has diminished, in particular education, science, law, and journalism. Together the essays depict a cultural and institutional revolution that is best understood in terms of individual agency, conflicts of interest, resource mobilization, and struggles for authority. 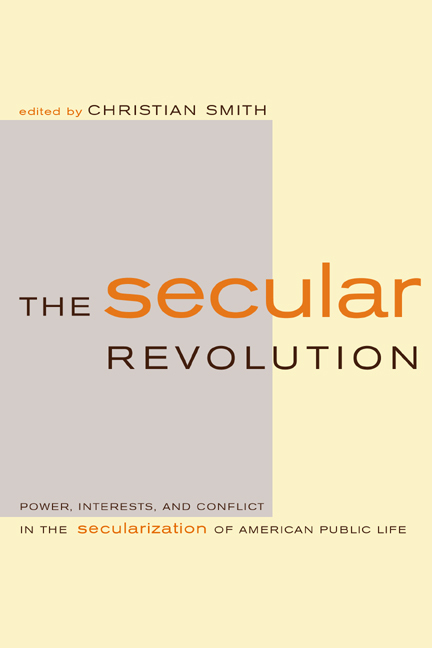 Engaging both sociological and historical literature, The Secular Revolution offers a new theoretical framework and original empirical research that will inform our understanding of American society from the nineteenth to the twenty-first centuries. The ramifications of its provocative and cogent thesis will be felt throughout sociology, religious studies, and our general thinking about society for years to come. Christian Smith is Professor and Associate Chair in the Department of Sociology at the University of North Carolina, Chapel Hill. He is the coauthor of Divided By Faith: Evangelical Religion and the Problem of Race in America (2001, with Michael O. Emerson), and the author of Christian America? What Evangelicals Really Want (California, 2000) and American Evangelicalism: Embattled and Thriving (1998).